We welcome the National Audit Office's advice to spend funds effectively and efficiently. 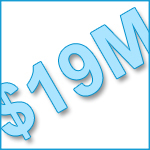 We have now passed the US$19 million mark, thanks to a donation from Good Ventures in California, USA! We are also close to our 67,00th donor too! Our sincere thanks to everyone for their support and generosity. You can see all our milestones on the website.